Fashion lovers, New York Fashion Week has officially begun and as always, we have locals on the ground. Mary O'Regan, Metro Magazine's fashion editor and Stephanie Davila, Minneapolis St. Paul Magazine staffer and freelancer extraordinaire will be broadcasting their NYFW adventures via Facebook, Twitter and Tumblr. 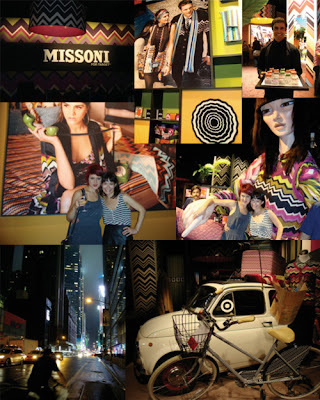 Stephanie stopped by the Missoni for Target event last night, with a former Minneapolite, Hillary Davis. Today's agenda included a meeting with editors at People Magazine and an impromptu lunch with a former InStyle co-worker. Follow Stephanie's antics via her blog and her Twitter account. As for Mary, she's on her way to NYC right now so make sure to check her Twitter account for updates. Another local tidbit includes former Fox9 news anchor turned jewelry maven, Robyne Robinson, who will be showing her wares alongside former Minneapolitan Ra'mon Lawrence Coleman at NY Fashion week! Congrats to them both. New York Fashion Week runs through Sept. 15. Photo via Stephanie Davila's Tumblr.